Presented here are two of Custers guidons; the Army of the Potomacs third Division Headquarters and personal guidons used by George A. Custer during the famous and brilliant Shenandoah Valley Campaign. It was used again later during the American Civil War. These two guidons, separated upon Custer's death in 1876 into different family branches of the Custer descendants, were reunited by the Zaricor Flag Collection in 1995. 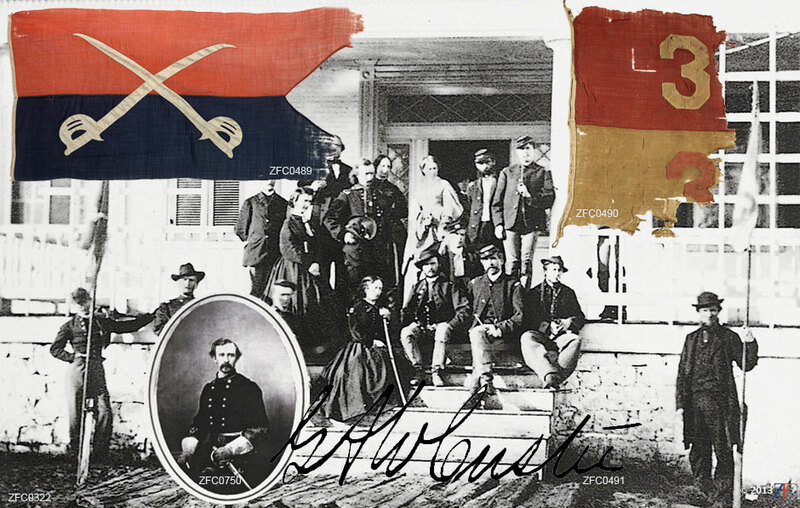 Incredibly, a photograph was later discovered showing the two flags and included in this collection is an official copy of the 24th December 1864, William H. Bowlsby photograph that depicts the guidons with Custer, his wife Libbie, who made the third personal guidon and his staff at his Winchester, VA headquarters. This personal guidon is considered his most important guidon and the model for a later replacement guidon he used during the Indian Wars and subsequently lost at the Battle of the Little Big Horn in 1876. Other significant items in the Custer sub-collection is his personal, autographed and dated copy of the 1861 edition of Cavalry Tactics or Regulations for The Instruction, Formations and Movements of The Cavalry of the Army And Volunteers of the United States. This was the standard tactics manual used at West Point by both the Union and Confederate cavalry early in the Civil War. Also included in the grouping are Custer's officer's belt, sword belt plate and sash, that was worn by Custer at his 9 February 1864 wedding to Elizabeth "Libbie" Bacon. The General George A. Custer Grouping also includes artifacts and other ephemera, including numerous books, many of which contain letters between Custer and his wife mentioning the sewing and delivery of the third personal guidon.